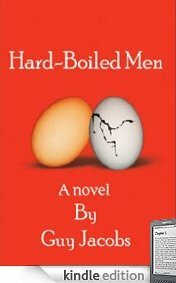 PAUL BISHOP ~ WRITER: E-BOOKS: HARD BOILED MEN! Follow under-sexed, over-analytical university professor Dr. Benjamin Wise, fresh off a horrific break-up, on a journey to reawaken his libido. Set against the backdrop of Asian massage parlors, University hallways and West Village anarchy, Hard-Boiled Men provides an honest and hilarious account of single life in New York City. The book exposes men's secret thoughts on the nature of love, marriage, and sexuality. Although Hard-Boiled Men is as likely to infuriate as entertain, Guy Jacobs' account of promiscuity and debauchery on the road to love speaks to our eternal quest for intimacy, home and finding out just who we are. Powerful, inspiring and heartfelt. Hard-Boiled Men is The Catcher in the Rye all grown up; there's a little bit of Ben Wise in every one of us.